I slid across the ice. Accidentally at first, and then as my comfort grew, I evolved my technique from a means of avoiding a broken tailbone to a proper, Risky Business-esque maneuver. Building a head of steam, I scurried across the frozen lake aiming squarely at a wind-swept portion of ice. A few feet before the snow stopped, exposing the glassy surface, I hopped, landing squarely with the toe of my right foot touching the back of my left Danner Mountain Lights. For twenty feet, I slid. Across the lake, in a protected cove, a group of colorful ice shanties broke up the green and white horizon. Marching across the frozen landscape one slide at a time, I made my way towards them, camera in hand. Months ago, I searched through flea markets and antique malls looking for windows. My interest in old windows as picture frames and not economic replacements was bewildering to most Mainers at local flea markets. After turning over many rocks, I eventually found some windows that were both aesthetically pleasing and practical as frames. Working with Tucker, we stripped the excess paint and applied a few coats of sealant to protect the frames. Throughout the summer as I transitioned into my new life in New York, Tucker put the finishing touches on the window frame. Outside of Skowhegan, Maine, one of my favorite shots. Near US Route 1 on the mid Maine Coast. Built on the concept that each frame and group of images will be unique, the finished window tells a story more complex and evolved that a singular image mounted on the wall. The finished window is 40" high by 25" wide and has 12 9" by 7" color prints. A lonely shanty Down East. Frozen footsteps captured by thaws and freezes. 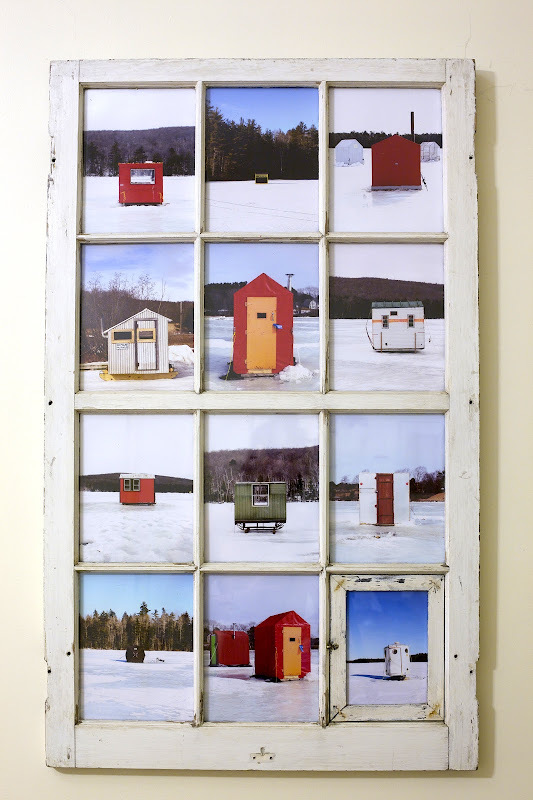 The Ice Shanty Window is the first of a series of my favorite images partnered with antique windows. 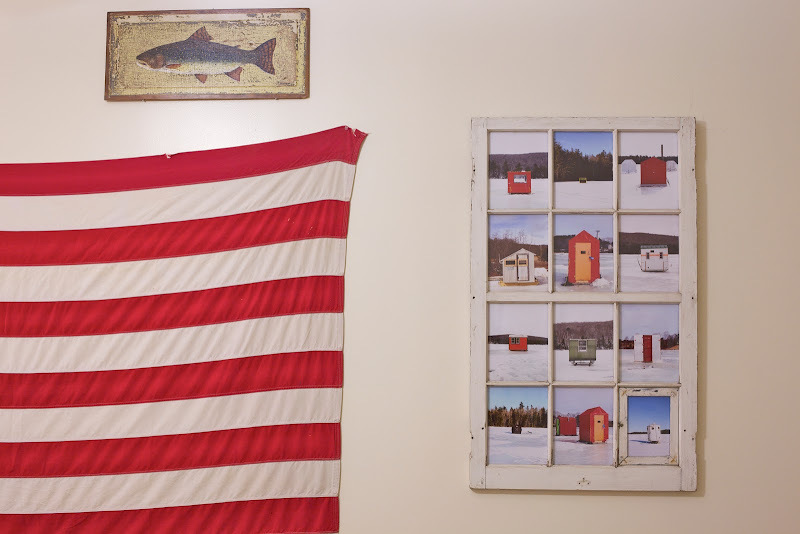 The shanties complement each other and providing context through repetition. Offering a view to a distant world, my window with its twelve images hangs over my living room for the time being. If you are interested in owning the Ice Shanty window, or one of the following ones, please send me an email at foster.huntington(at)gmail.com.